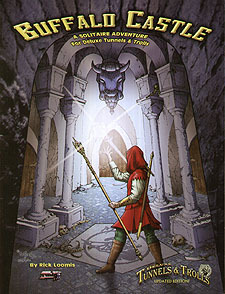 Buffalo Castle is the first adventure designed for use with Tunnels & Trolls warrior charact4ers. It is an excellent introduction to FRP game playing and solitaire adventure play in particular. Buffalo Castle has an abundance of rooms, traps, monsters... and treasure! If you have only a little time to play, then the Solo Dungeons are designed for you. You need only the rules for Tunnels & Trolls, a few six-sided dice, paper, pencil and this booklet to play. This updated edition also includes new art by Liz Danforth, additional enhancements to the storyline and information to help you use this solo as a GM Adventure.